Can you please share this pattern? I’ve been looking for months for a pattern to make this exact blanket/throw! Well, I meant to respond sooner than this. I just got side-tracked. What you said makes perfect sense and I felt silly for not figuring it out myself. (: What I have done so far looks great and I thank you so much for your help. I’m on a bit of a break right now because I had surgery on my hand a couple of weeks ago but I hope to pick it back up soon. Hello again! 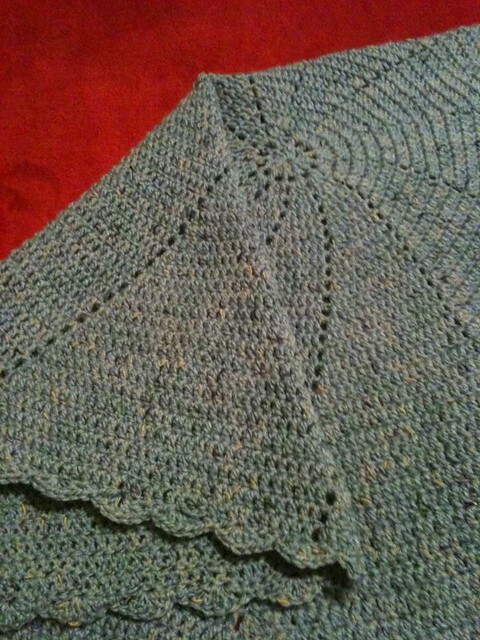 I’m happy to report I finished my round blue baby blanket on Christmas Day. I even did a scalloped border like you did. It turned out very nice and I’m excited to present it to the mommy-to-be. If you can access this link, I’ve posted a few pictures on Flickr.